INTRODUCTION: In the space of two years, Michael Sullivan has moved from a small press debut author who was featured in one of my first "Indie Spotlight Reviews" to a "name" in the fantasy field whose wonderful Ryria Revelations is being published by Orbit Books in three consecutive omnibuses starting with Theft of Swords which is already out in stores as I saw last Sunday in my local B&N. While I have reviewed the two books that form this omnibus close to their original small press publication, I am re-posting the reviews below with some additional thoughts about how the Orbit edition differs and how the series has gained by the tighter editing. The most important difference is that the series debut, The Crown Conspiracy, has gotten a new first half-chapter that introduces the main two protagonists Hadrian and Royce outright. But do not worry, even if you read the original edition and do not want to buy the omnibus, you can read this chapter for free as it is bundled with The Viscount and the Witch short story that functions as a series prequel set some 10 years earlier. Click on the link above and get the story and the first revised chapter of The Crown Conspiracy from the author's site! However there are more little touches that the new Orbit edition adds by a really close editing. 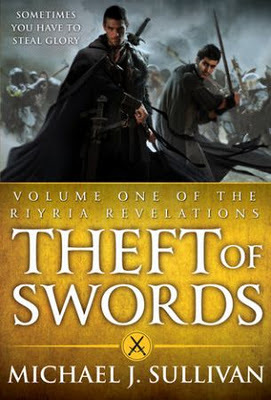 When I got an advanced copy of Theft of Swords some months ago, I opened it just to take a look and read the revised first chapter as I have heard about that earlier. But once I started reading I could not put the book down despite that I have read both included novels a few times before and I ended up with a full read of the omnibus while in the process I started noticing that there were places where it flowed much better than the originals. Went and checked with my 2008/09 copies and sure enough there were little differences here and there - most notably when the main heroes meet a character who for the obvious reason of being locked up in time stasis for close to a millennium, talks archaic - in the original the author mostly kept the archaic language consistent, but there were a few slips to modern and while they were minor, they still broke a little the narrative flow; in the omnibus everything is consistent. Overall though the differences are minor in the 700 pages scheme of things, so go and enjoy the "mainstream" debut of this superb series! SETTING: On the alternate Earth-like planet of Elan, the Novronian Empire of legend has sundered centuries ago into many different states. This was supposedly due to the machinations of the dastardly wizard and traitor Esrahaddon. The imperial Nyphron Church and its various loyalist nobles and knight orders have been looking for the mythical “Heir” to the Empire for almost a thousand years now. In the meantime, the kingdoms that coalesced on the Empire's territory developed Nationalist movements of their own opposed to the Imperialist goals and the monks dedicated to the god Maribor that predated Empire and Church. One such kingdom is Melegar, and when its ruling king is murdered, the young Crown Prince Alric and his older sister Arista—who would be Queen if her brother should die—are thrust into the limelight and a brutal struggle for power that may have much greater implications for the “big picture” than whoever governs a minor kingdom. Archibald Ballentyne is a very ambitious second-tier noble from the neighboring kingdom of Ghent—not that he harbors any particular loyalty to “his” king—and is willing to do whatever shady deals he can to advance. Royce and Hadrian are a freelance “object/documents” acquisition and recovery team. In other words, Royce is a skilled thief with a mysterious past while Hadrian is a very good fighter who excels with the sword and bow. Using an impoverished noble as a front man, they peddle their trade to the high & mighty and anyone that can pay, outside of the Protection/Underground Guilds extant in most towns. FORMAT/INFO: “The Crown Conspiracy” stands at 296 pages divided over ten named parts, each subdivided into several numbered chapters. Included at the beginning of the book is a map which is also available on the author's website, as well as a table of contents. The action takes place mostly in the novel’s present-tense and is narrated in the third-person via several POVs, most notably Royce and Hadrian, with Archibald, Myron, Alric and Arista having good chunks of face time too. The ending is very good, wrapping up the main threads of the novel, but as with any opening volume in a series, the big-picture events are just now starting to impact our heroes. October 1, 2008 marks the Paperback Publication of “The Crown Conspiracy” via Aspirations Media Inc. Cover art is provided by the author himself, Michael Sullivan. PLOT HINTS AND ANALYSIS: “The Crown Conspiracy” starts with a caper in Archibald Ballentyne's castle and stays on a roll from there to the end. We first meet Royce and Hadrian when they frustrate one of Archibald's machinations—which they originally helped get started by stealing some letters—but what's better than getting paid again even more handsomely to restore those very same letters to their rightful owner? Of course this kind of double-cross dealing with the high & mighty comes with a risk as Royce and Hadrian find themselves framed and imprisoned to be tortured and executed for the death of the King of Melegar, which they believed was a lucrative “mercy” job for an endangered noble. Luckily, Princess Arista—for reasons of her own which may or may not be the selfless ones she claims—helps them escape with the new King Alric in tow as a hostage/protégée. In conclusion, “The Crown Conspiracy” is great fun and a romp end to end. It's a very fast read and I finished it in one sitting. Its characters grow on you and the series has great potential to develop since Book One only explores a relatively small part of the wonderful imagined world of Michael Sullivan, and I am really looking forward to reading Book Two, “Avempartha”, out in April 2009. “In conclusion, “The Crown Conspiracy” is great fun and a romp end to end. It's a very fast read and I finished it in one sitting. Its characters grow on you and the series has great potential to develop since Book One only explores a relatively small part of the wonderful imagined world of Michael Sullivan”. “The Crown Conspiracy” was essentially a standalone with hints of the larger picture, while “Avempartha” goes straight into the deeper issues of Mr. Sullivan's richly imagined universe and reads more like a series opener than a second volume. The following review is mostly independent of “The Crown Conspiracy” one and contains very few series spoilers. SETTING: On the alternate Earth-like planet of Elan, the Novronian Empire of legend has sundered centuries ago into many different states, supposedly due to the machinations of the dastardly wizard and traitor Esrahaddon. For almost a thousand years now, the imperial Nyphron Church and its various loyalist nobles and knight orders have been looking for the mythical “Heir” to the Empire, a person of Novron's bloodline and supposedly the only one capable of passing secret tests jealously guarded by the Church. In the meantime, the kingdoms that coalesced on the Empire's territory developed Nationalist movements of their own opposed to the Imperialist goals and the monks dedicated to the god Maribor that predated Empire and Church. One such kingdom is Melegar and young King Alric has a problem: his older sister Arista is restless, does not want to marry and settle down, and has developed a reputation as a ‘witch’ for being a student of Esra. Since Arista helped save Melegar from the clutches of usurpers, Alric owes her his life, and sends her on an important mission. But he also sends the high ranking Bishop Saldur as an “advisor” who has designs of his own. Royce and Hadrian are a freelance “object/documents” acquisition and recovery team. In other words, Royce is a skilled thief with a mysterious past while Hadrian is a very good fighter who excels with a sword and bow. Using an impoverished noble as a front man, they peddle their trade to the high & mighty and anyone that can pay. But because they have now attracted the attention of the powerful, they are thrown into the middle of the “great game”. On the edge of empire, the long-lived but slow-reproducing elves are watching. While the elvish mixed-blood population living in human territory are stereotyped, oppressed and mistreated, the pure-blooded elves retreated millenia ago beyond the border river Nidwalden, and only the abandoned castle of Avempartha remains as a reminder that they are still there, waiting for any sign of human weakness. The village of Dhalgren technically breaks the human-elvish treaty by being too close to Nidwalden, but it has not been bothered for many years. However, a monstrous being has recently started terrorizing the village and killing its inhabitants indiscriminately. FORMAT/INFO: “Avempartha” stands at 332 pages divided over fifteen titled chapters. The narration is in the third person and takes place into the present of the novel. The main POVs are Royce, Hadrian, Arista and Thrace with Esra stealing the show whenever he makes an appearance. There are other secondary returning characters from the first novel, most notably the dwarf Magnus and the brothers Pickering, Mauvin and Fanen, but the foppish villain I loved to hate, Count Archimbald, is missing. Instead, we get the chilling “Sentinel” Guy. The ending is excellent and solves the main issue of the plot, but this time there is a huge ‘To Be Continued’ sign, so I eagerly await the next installment. April 1, 2009 marks the Paperback Publication of "Avempartha" via Aspirations Media Inc. Cover art is provided by the author himself, Michael Sullivan. Meanwhile, the slow unfolding of secrets and tapestries weaved over the centuries since the fall of the Empire—and possibly even before—is very well timed, and there are some unexpected twists and turns, though we also start seeing a little bit of the big-picture outline. In particular, the Imperial succession which clearly dates back to the murder of the last emperor and the possible elvish threat that goes back to the times of legend well before the Empire even existed. Of the main POVs, Arista, Hadrien and Royce stay in character from “The Crown Conspiracy”, but are written with much more detail and depth, while Thrace is a great addition, bringing an “innocent, regular girl” perspective that contrasts nicely with the other characters. I particularly liked the reintroduction of Magnus and his cynical dialogue and wordplay with Royce who still wants his head for obvious reasons.